I�EUR(TM)ve been craving the smooth taste of hearty chickpeas ever since reading about Mike�EUR(TM)s channa masala. So, not surprisingly, Sunday�EUR(TM)s lineup included chickpeas. 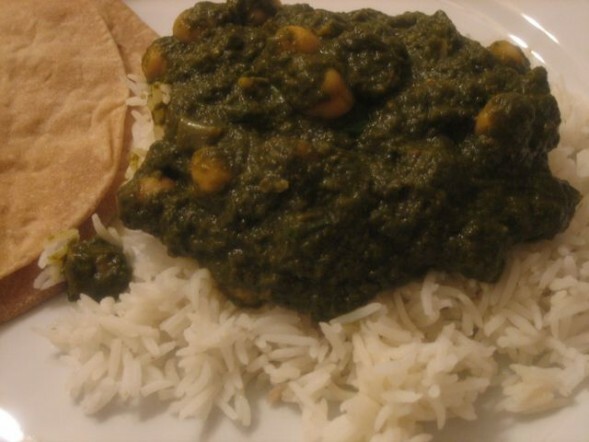 As a healthier alternative to palak paneer, we decided to make palak channa. Soft, buttery chickpeas swimming in pureed fresh spinach made for a fulfilling end to a lazy weekend. You can also substitute paneer or aloo (potatoes) for the chickpeas. You can substitute pan fried paneer, tofu or potatoes for the chickpeas in this dish for easy variations. Just pan fry the paneer, tofu or potatoes separately until golden and add in place of the chickpeas in step 8 below. 1. Before removing the twist tie or rubberband holding the spinach bunches together, trim the stems off. Then wash well in a colander and use your hands to squeeze out the water. 2. Heat about 1 tbsp. oil in a deep skillet. Add the green chilis and spinach. Cook for about 10 minutes or until the spinach is wilted. As a time saver, I add each bunch to the skillet as it�EUR(TM)s cleaned and squeezed – it�EUR(TM)s okay to not add it all at the same time. Set aside to cool. 3. Add the garlic and ginger to a food processor bowl and process until minced. Add the onions and process until finely diced. Add to a hot skillet and cook on medium-high until the onions are translucent. 4. 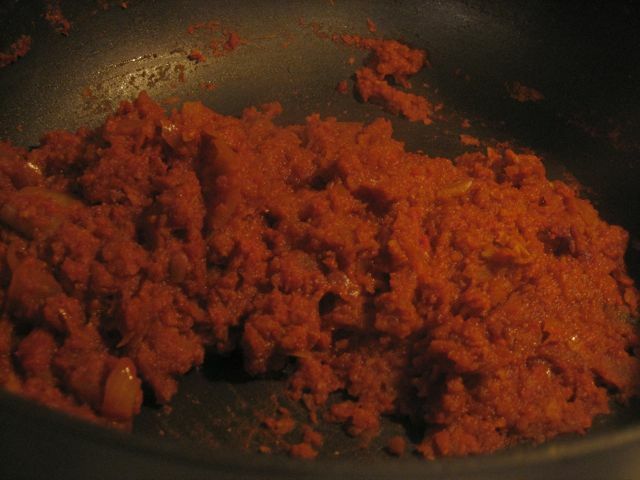 While the onion mixture cooks, add tomatoes to the food processor bowl (no need to clean between this and the above step) and puree. Add to the onion mixture. 5. Add all of the masalas. Mix well and cook on medium heat, halfway covering the skillet with a lid. Cook for about 30 minutes until the liquid dissolves. 6. Mix in the whisked yogurt. 7. 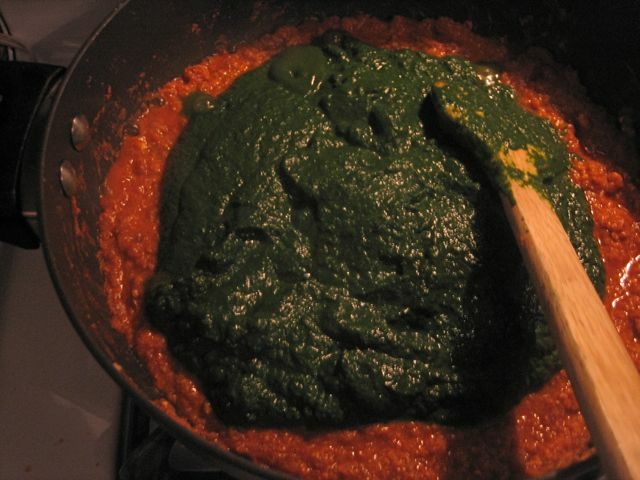 Puree the spinach and then add it to the skillet and fold in with the masala. 8. Add the chickpeas and continue cooking for about 15-20 minutes on medium-low heat until you have the desired thickness. Serve hot with basmati rice and roti. *The first time I made palak, I used frozen, chopped spinach. The result was a bitter, cardboard-ish tasting sabzi. This could be attributed either to first time, beginner bad fortune (aka user error). I decided it was due to using frozen rather than fresh spinach and only use fresh now! You can also use 2 bunches of spinach and 1 bunch mustard greens and make this dish into palak saag. i love how your recipe uses fresh spinach (instead of frozen) and yogurt (instead of cream). i have to make this! btw – your photography is beautiful. Ameet, thanks! Photography has been a real challenge for me so I really appreciate that. Let me know how it turns out. Btw I didn’t mention it if you wanted to make this a little richer and by that token though, less healthy, you could substitute light cream for the yogurt…but we generally stick to low fat yogurt…Desi Dahi if we manage to make it to the Indian grocery store. Thanks Mike. I love this recipe b/c it’s really flavorful but not overwhelming – so you can still taste the veggies! Trupti, we love paneer too! I actually made palak channa for the first time for a dinner party where I had a show stealing paneer dish, and we liked it so much that it became a regular for us. Let me know if it wins your hubby over! I want to come to your house for dinner. This Palak Channa looks and sounds delicious! your palak channa looks delicious! Your entry is just in time for JFI Chickpea. You could also send this over to Srivallis legume affair. The photographs are quite illustrative. Ms, thanks! I’m so happy to finally be able to contribute to JFI after reading about it for so long on Mahanandi in my pre-blogging days! I’ll check out the legume love affair…I’ve read a lot about it and definitely have my own love affair with legumes. This is one of my favorite dishes to get at the local Indian restaurant and I can’t wait to make it. Also, very happy I found your blog because I definitely want to learn more about Indian cooking. Jeff, let me know how it turns out. 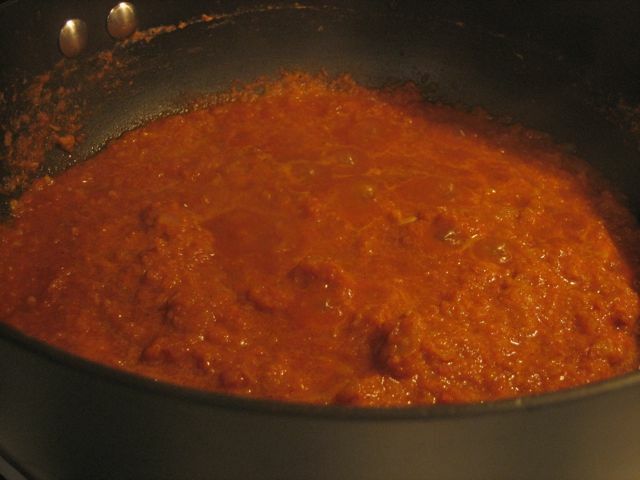 Once you get the basic tomato masala portion down, you can repeat it for a lot of Indian dishes. Looking forward to reading about more of your culinary “disasters” – glad I found your blog too! Mmm. I made this last night – really yummy! I somehow managed to make it super spicey though! Maybe this is a spicey recipe? Or did I do something wrong? Swati, it shouldn’t be that spicy…the measurements are “as is” when I made it…did you use more spices (lal mirch and garam masala are the most likely to add heat) or maybe less spinach? Those are the two things that I think would change the spice level other than the green chilis. If you want to tone down the spice, try adding a LITTLE sugar (I promise as long as you don’t use a lot of sugar, you won’t end up with dessert) – depending on how over spiced it is, add about a 1/2 to a 1/4 teaspoon sugar and then taste and increase as needed. Your blog is full of amazingly yummy recipes…tried this today and it was delicious!! hungrydesi is my fav site these days! Aarti, thanks for the compliments and the comment. I love hearing from readers who have tried my recipes! This looks lovely. Wish I’d consulted your blog before making my attempt. Maggie, I thought your channa saag looked delicious! I loved that the sauce was creamy…it’s milk based right? I think my version is maybe just more of the traditional version 🙂 And you should definitely have that Indian dinner party! i likeur recipe. but can i chop the spinach instead of grinding. i think by grinding spinach the texture changes; i find it becomes more like mehndi and tastes like that but chopping doenst mak it like that. Wt do u say…..
Farah, thanks – glad that you like the recipe. You could definitely try chopping it…I haven’t done that before but am thinking about it after your suggestion. I think it would still taste really good and just have be a heartier texture. Let me know how it turns out. Btw I find that mehndi taste happens when I use frozen. Does it happen with fresh too? I wonder if it’s maybe due to overcooking? Thanx 4 ur prompt reply; i really appreciate. One mor query plzzzz, is ur 1 bunch of spinach =450gms ( i got it frm the net)if not let me know. u know i dont know much cooking so before i make an attempt i really want to mak sure the qty of main ingre atleaast bcoz it does make a difference. Thanx once again. Hi Farah, sorry I’m not sure what the conversion would be…I’m inclined to believe the translation from the net. Let me know! This dish looks and sounds extremelly delicious, and I can’t wait to make it tonight! @Vina – thanks for catching that – it should be one 28 oz can. I’ve been making almost the same thing (minus the tomatoes) for years. One thing I like to add at the very end is dried fenugreek leaves. It gives it a special kick! @lauren – what a nice add. I’ll have to try that next time. Thanks – appreciate the comment! I’m glad you enjoyed it. Left over palak channa for breakfast sounds like it would hit the spot. I noticed it says 1 1inch piece of garlic… But in the instructions it says ginger. Should i buy 1 inch thick of ginger? Then do i grate the ginger?? Hi sorry for the typo. It should be a 1 inch piece of ginger, peeled then chopped. And 3 cloves garlic, peeled and chopped. When you put them in the food processor, they’ll get minced. This was amazing! I used less salt, plus skipped the yogurt and mashed up a small amount of chickpeas to thicken, also added a little extra oil and water, and simmered it a little longer. Will definitely make again! Thanks! I’m so happy to see hear that. I made it this weekend with pan fried cubes of tofu and sauteed mushrooms. Hi Leanne, thanks – so happy to hear the feedback about the recipe and my site. I’m fine with you blogging the recipe as long as you attribute it as mine with a link. That’s generally okay with most bloggers. Leave a link here with the post! Much googling has revealed that a typical bunch of spinach (weighing in at approximately 11 oz) comes to 6 oz of leaves after the stemming and trimming. So the above recipe should call for about 24 oz of leaves if you have to buy bagged. Huzzah and blessed be, it only took me two years to work that out properly! @Kat – thanks for relaying that info! And for the lovely comment about my blog and this recipe. I love this recipe and love the pictures. I have posted a link to your recipe under my own recipe for Palak Chole, do take a look when you have a chance. I have also recently published a cookbook of healthy Indian food. Hi Cheeku, thanks for the comment…I took a look at your blog and it’s terrific. Will have to check out the cookbook. Congrats on publishing it.